In Makueni County, located in the southeast of Kenya, there is very little rain, and it falls in just two short rainy seasons per year. As climate change pushes average temperatures higher and precipitation lower, drought and water scarcity are common. Here, as in many parts of Kenya, much of the population gets its drinking water from unsafe sources such as ponds, streams or unprotected wells. Water from these sources is often contaminated with dangerous bacteria that can cause serious illness. According to cultural practice, it is typically women’s and girls’ responsibility to gather clean water, usually far away. This means long walks to collection points and hours lined up in scorching heat, leaving them vulnerable to sexual assault and other dangers. 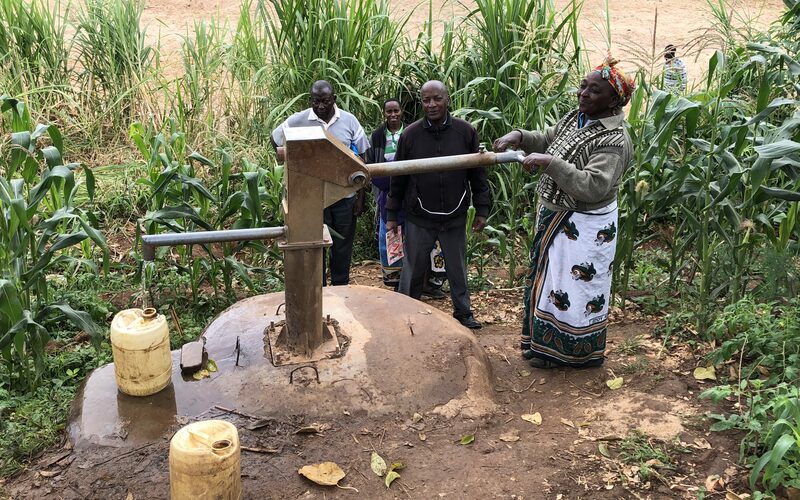 To make it easier for people to get safe water, PWRDF has partnered with Utooni Development Organization (UDO) in a project to install shallow water wells with hand pumps in nine communities in Makueni County, Kenya. UDO has already been involved in constructing sand dams, which are reinforced concrete walls built across a river to collect water. Now with more than $30,000 in funding from PWRDF, sealed pump wells are being installed in order to make the water from these sand dams easier to collect, and safer to drink. Thanks to a sealed concrete slab on the surface and underground filtration chambers, these wells will also minimize contamination, protecting the community from water-borne illnesses such as cholera and typhoid fever, which are prevalent in the area. The wells will also drastically cut down the distance and wait time for women and girls to collect clean water, keeping them safe and freeing up time allowing them to focus on other priorities. The project will provide the community with training on how to properly conserve and protect sources of water as well as how to store and treat water within households. Priority will be given to the most vulnerable communities with a plan to directly benefit 1,620 people, including 1,080 women and girls. UDO has been active in helping Kenya achieve sustainable development since its inception in 2005. The organization was awarded with the United Nations Development Program Equator Initiative Award in 2014 for its outstanding work promoting local sustainable development and PWRDF looks forward to a strong partnership with UDO.